I'm a loooong time Dune fan and reread the books on a regular basis. I'm here looking to chat with other fans of Dune and all things Dune related. Naib wrote: I'm here looking to chat with other fans of Dune and all things Dune related. Thanks for the kind welcomes. yw:) so what's your favourite moral quandary in the Dune books? Favourite moral quandary? That's a thinker. Off the top of my head I'd say Thufir's decision to work for the Harkonnen's. Naib wrote: Favourite moral quandary? That's a thinker. Off the top of my head I'd say Thufir's decision to work for the Harkonnen's. To strike at the Harkonnens from the inside? He did try to assasinate Feyd and help Feyd try to kill the Baron. True. But it still would have been a difficult decision to make at the moment. He wanted to stay alive to revenge his Duke by killing the Baron, Feyd and hopefully the treacherous Bene Gesserit witch ... not a difficult decision at all if you ask me. But what about all the loathsome things he'd have to do for the Baron in the meantime? His soul would be forever stained just for the chance to kill the Baron, Feyd, and Rabban. If he'd have to hurt innocent people just to make the attempt at revenge it would make Thufir little better than the Baron himself in the end. If you assume that the rule by the Atreides was in any way a lot more "peaceful" or a lot less "dictatorial" than the Harkonnen. Both Atreides and Harkonnen are Aristocratic houses that rule entire planets. How do you think the "serfs" of the Atreides thought about their rulers? Is it any better to help a Duke oppress the people (mostly innocent) of a whole planet ( Caladan and later Arrakis ) than it is to help the Baron? It never came across to me that the Atreides were oppressive towards their own subjects. On the contrary they seemed to go out of their way to treat their subjects with compassion and dignity. That's not to say that people wouldn't be treated harshly if there was a good reason, but I think they would make damned sure there was a good reason. The ending of the degrading ritual of water slopping is a fair example I think of how the Atreides treated their subjects compared to the Harkonnens. I wouldn't say Thufir helped Duke Leto oppress his populations, I think he used his as more of a tool of statecraft. Espionage and whatnot. 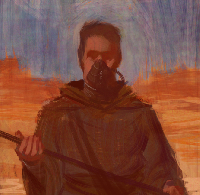 However, Thufir did instruct the Baron to oppress the people of Arrakis. But I think that was to bring down the wrath of the emperor for trying to turn Arrakis into another Salusa Secundus. Naib wrote: On the contrary they seemed to go out of their way to treat their subjects with compassion and dignity. Sedondly: The Duke send buyers to the Bene Gesserit to buy a Concubine .... hardly a show of compassion and dignity in my opinion. Naib wrote: The ending of the degrading ritual of water slopping is a fair example I think of how the Atreides treated their subjects compared to the Harkonnens. It was Jessica who ordered this. Neither the quartermakers who arrived first on Arrakis or the Duke or Paul for that matter stopped the ritual. Besides ... stopping this ritual was the fantastic piece of propaganda for the Atreides'new rule. But still there was apparently a great shoratges of water. Even the flowerroom was kept intact "to preserve it for the people" instead of giving the vast amounts of water to the poorest. "The custom stops here!" he muttered. table toward him, and he noted the leathery face, the blue-within-blue eyes. "My Lord wishes?" She kept her head bowed, eyes shielded. He gestured. "Have these basins and towels removed." But Serkanner has a point, there was nobility and the faufreluches. If you weren't nobility you were a peon. Without question. The serf life wouldn't be too grand. Ouch! ... I have been poisoned by the TV series. In the TV series it is Jessica that stops the custom. Naib wrote: Without question. The serf life wouldn't be too grand. The first few times I read Dune ( age 15-20 ) I saw the Atreides as the good ones, the rightful ones. Then I grew up and started to read more between the lines. Education, experience and lots of re-reading an dof cours ethe debates on numerous Dune sites have shaped my perception of the books. My perception is not the truth of course and that is why this site in particular is so great. It gives us the opportunity to study and learn all there is about the books ... and opinion and perceptions do differ. In other words: great to have you here sharing your insights and perception. Cheers Serkanner. I like your arguments and they'll probably come back to me the next time I reread Dune.